Braised and Broiled Ribs is a Canadian food recipe with homemade sauce. Using a fork, lift the membrane from a corner of the rib bones on the non-meaty underside; gently peel it away from the ribs and discard. Place ribs in a single layer in a baking tray or dish, meaty side up. Add 2 cups hot water to the tray. Cover with foil and bake in oven for about 1 hour, or until meat is easily pierced with a sharp knife, and is beginning to pull away from the rib bones. Combine remaining ingredients in a saucepan and bring to a boil over high heat. Reduce heat and simmer for 10 minutes, or until sauce thickens slightly. Switch oven to broiler, preheat on HIGH. 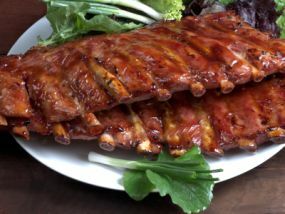 Place ribs on a foil-lined baking sheet and baste with sauce. Broil 5 to 6 inches from heat until sauce starts to bubble, about 3-5 minutes. Remove from oven, turn over and baste other side of ribs. Return to oven and broil for another 3-5 minutes.